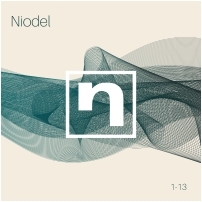 Niodel is a bass player and drummer duo from Berlin, that also performs live electronics. The project is founded upon the continuous exploration of sonic possibilities and musical combinations. This research allows the duo to compose and improvise from various perspectives. Sound manipulation sometimes becomes a context in which the artistic ideas are shaped and in other cases it has a leading role in the arrangement and improvisational choices. The constant goal is to expand the duo idiom, also overcoming the traditional feature and timbre of each instrument. Through the use of electronics, the language of the project develops into personal rhythmic, melodic and harmonic shapes. The bass and the drums blend into one another and they both contribute, from several angles, to laying down the groove, to the thematic and soloing expositions and to the enrichment of the harmonic structure. Every musical element is generated exclusively live through the bass and the drum set. "1-13" is the name of the album debut. 47 minutes of music, 13 experimental tracks of in which the absence of a singer is not a defect and rhythm and harmonies make the same aforementioned tools turn the instrument as means of communication for an additional language. Harmonic explosion that undoubtedly deserves careful listening.